UNDATED - "Scotty Philip's Buffalo Herd" is the new photo display in the Education Room of the Cultural Heritage Center in Pierre. James "Scotty" Philip was a Scottish-born rancher, businessman and politician commonly known as "The Man Who Saved the Buffalo." He purchased buffalo from the estate of Fred Dupree, who had rounded up five bison calves in the 1880s when buffalo were on the brink of extinction. Philip prepared a specially enclosed pasture for the buffalo on his ranch along the Missouri River located north of Fort Pierre. At the time of Philip's death in 1911 there were approximately 1,000 head of buffalo on the ranch. "Scotty Philip's herd was one of the most photographed groups of buffalo in North America," says state archivist Chelle (pronounced SHELL-ee) Somsen. 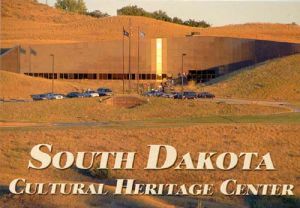 "These particular images are held in the State Archives photo collections and many are viewable online at the South Dakota Digital Archives." There are currently over 63,000 photographic images from throughout the state available for viewing by visiting history.sd.gov/archives and clicking on the link to the "South Dakota Digital Archives."